The chilly weather did not hamper the elephants reveling in their new habitat or dampen the spirited celebration of the assembled guests. Light refreshments and a heated canopy made for a comfortable program and honored guests received small silver elephant talismans as reminders of the gift they had provided to the resident herd. The Oregon Zoo hosted AAZV and NAG members for a day-long event filled with workshops highlighting the cutting edge practices that the Oregon Zoo embraces. Such activities included target shooting with a tranquilizer gun, a hay loader demonstration, and a nutrition-rich carcass feeding for the Zoo’s pride of lions. Dinner for the veterinarians was served under a canopy of cafe lights on the main lawn. Chief Tsungani and his family donned their traditional button blankets as they sang and drummed to celebrate the installation of the newly refurbished Survival Totem Pole. 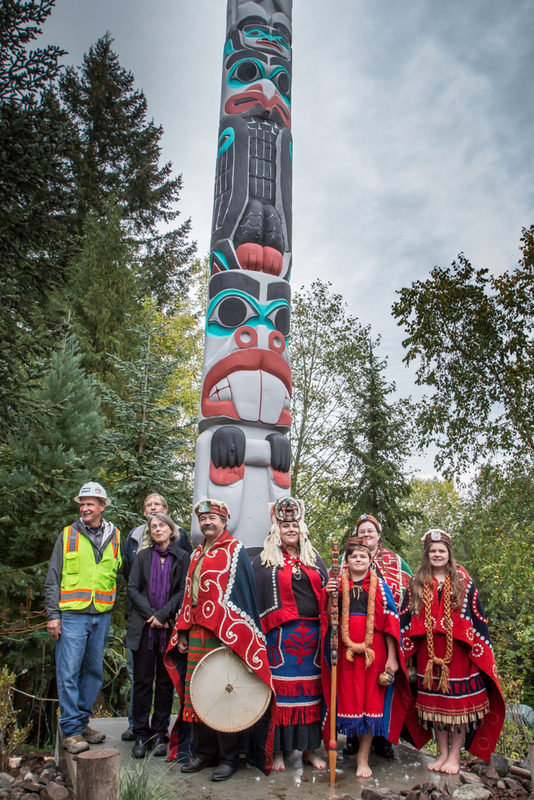 A second totem pole, the Losey Totem, was also proudly reinstalled at a separate location.